Aurora, a suburb of Chicago, is a city in DuPage, Kane, Kendall, and Will counties in the U.S. state of Illinois. Located primarily in DuPage and Kane counties, it is an outer suburb of Chicago and the second most populous city in the state, and the 114th most populous city in the country. The population was 197,899 at the 2010 census, and was estimated to have increased to 200,965 by 2017. The Aurora area has some significant architecture, including structures by Frank Lloyd Wright, Ludwig Mies van der Rohe, Bruce Goff and George Grant Elmslie. Aurora is also home to a large collection of Sears Catalog Homes (over 50 homes) and Lustron all-steel homes (seven homes). The Hollywood Casino Aurora, a dockside gaming facility with 53,000 square feet (4,900 m2) and 1,200 gaming positions, is located along the river in downtown Aurora. Before European settlers arrived, there was a Native American village in what is today downtown Aurora, on the banks of the Fox River. In 1834, following the Black Hawk War, the McCarty brothers arrived. They initially owned land on both sides of the river, but sold their lands to the Lake brothers on the west side. The Lake brothers opened a mill on the opposite side of the river. The McCartys lived and operated their mill on the east side. A post office was established in 1837, officially creating Aurora. Aurora was originally two villages: East Aurora, incorporated in 1845, on the east side of the river, and West Aurora, formally organized on the west side of the river in 1854. In 1857, the two towns joined officially, incorporated as the city of Aurora. As representatives could not agree which side of the river should house the public buildings, most public buildings were built on or around Stolp Island in the middle of the river. As the city grew, it attracted numerous factories and jobs. In 1856, the Chicago, Burlington and Quincy Railroad located its roundhouse and locomotive shop in Aurora, becoming the town's largest employer, a rank it held until the 1960s. Railroad restructuring in the railroad industry resulted in a loss of jobs as the number of railroads reduced and they dropped lines for passenger traffic. Aurora at one time had regularly scheduled passenger trains to Chicago. The heavy industries on the East side provided employment for generations of European immigrants, who came from Ireland, Great Britain, Scandinavia, Luxembourg, Germany, France, and Italy. Aurora became the economic center of the Fox Valley region. The combination of these three factors—a highly industrialized town, a sizable river that divided it, and the Burlington railroad's shops—accounted for much of the dynamics of Aurora's political, economic, and social history. The city openly supported abolitionism before the American Civil War. Mexican migrants began arriving after the Mexican Revolution of 1910. Socially, the town was progressive in its attitude toward education, religion, welfare, and women. The first free public school district in Illinois was established in 1851 here and the city established a high school for girls in 1855. Aurora is at 41°45′50″N 88°17′24″W﻿ / ﻿41.76389°N 88.29000°W﻿ / 41.76389; -88.29000 (41.7637855, −88.2901352). The West Side, which is west of the Fox River. Fox Valley, also referred to as the Far East Side, is the portion of Aurora east of the Dupage County line. Its name is deceptive because it is actually the part of the city farthest from the Fox River and its valley. The area acquired its name because of its proximity to the Westfield Fox Valley Mall and Fox Valley Villages, one of the first housing developments to be constructed after the mall. Aurora has not been struck by any major tornadoes in recent history, although they occur in Northern Illinois annually. In 1906, a tornado went through the Aurora Driving Park, a large recreation/amusement park and race track where the Riddle Highlands neighborhood and Northgate shopping center is today. The tornado hit during the afternoon performance of the Ringling Brothers "Greatest Show on Earth" circus, when the park was crowded. It killed 2 people and injured 22, but the grandstand was still filled for the evening performance. Weak tornadoes struck the city in 1954, 1958, 1960, and 1991. In 1990, the supercell thunderstorm that produced the deadly Plainfield Tornado passed over the city, dropping golf ball sized hail and causing wind damage. Less than ten minutes after passing through Aurora, the storm produced an F5 tornado, which touched down in nearby Oswego, less than 5 miles from downtown. The tornado then traveled through Plainfield and Joliet, killing 29 people. Aurora was hit with one of the strongest earthquakes ever to strike Illinois, a M 5.1, on May 26, 1909. It put cracks through chimneys and could be felt 500,000 sq mi (1,300,000 km2) around. As of the American Community Survey of 2016, there were 200,907 people, 61,831 households, and 46,131 families residing in the city. The population density was 4,389.5 inhabitants per square mile (1,694.8/km2). There were 66,447 housing units at an average density of 1,451.8 per square mile (560.5/km2). The racial makeup of the city was 56.5% White, 10.2% African American, 0.4% Native American, 7.7% Asian American, 0.1% Pacific Islander, 22.4% from other races, and 2.7% from two or more races. Hispanic or Latino of any race were 42.7% of the population. There were 61,831 households out of which 46.3% had children under the age of 18 living with them, 54.4% were married couples living together, 13.9% had a female householder with no husband present, and 25.4% were non-families. 19.9% of all households were made up of individuals and 5.7% had someone living alone who was 65 years of age or older. The average household size was 3.12 and the average family size was 3.63 as of the 2010 census. The median income for a household in the city was $63,967, and the median income for a family was $72,696. For full-time workers, males had a median income of $48,296 versus $37,823 for females. The per capita income for the city was $26,989. About 11.1% of families and 14.0% of the population were below the poverty line, including 20.6% of those under age 18 and 8.8% of those age 65 or over. Aurora is on the edge of the Illinois Technology and Research Corridor. The city has a long tradition of manufacturing as does much of Chicago metropolitan area. Prominent manufacturers, past and present include Lyon Workspace Products, The Aurora Silverplate Manufacturing Company, Barber-Greene Company, the Chicago Corset Company, the Aurora Brewing Company, Stephens-Adamson Company, Caterpillar Inc., Allsteel Metals, National Metalwares, and Western Wheeled Scraper Works (later Austin-Western Inc.). The most prominent employer and industry was the Chicago Burlington and Quincy Railroad (later Burlington Northern) which was headquartered in Aurora. The CB&Q Roundhouse is still standing, and is now the popular restaurant originally called Walter Payton's Roundhouse; after the Payton estate ended its involvement in 2009 it became known as America's Historic Roundhouse, and after a 2011 change in ownership, it is now known as Two Brothers Roundhouse. Formed in 1987, the Aurora Area Convention and Visitors Bureau (AACVB) is a private, nonprofit organization dedicated to aggressively promoting and marketing the area as a premier overnight destination. The AACVB'S goal is to enhance the economic and environmental well-being of a region comprising ten communities: Aurora, Batavia, Big Rock, Hinckley, Montgomery, North Aurora, Plano, Sandwich, Sugar Grove, and Yorkville. Aurora's downtown is full of architectural landmarks and historic places. It includes a major Hindu temple, the Sri Venkateswara Swami Temple of Greater Chicago. Aurora also has its own zoo, Phillips Park Zoo, in Phillips Park. Downtown Aurora is home to the Paramount Theatre, a large live performance theater on the National Register of Historic Places, and the Hollywood Casino. There is also the Leland Tower, a former hotel which was the tallest building in Illinois outside of Chicago and is on the National Register of Historic Places. The largest collection of commercial buildings by Prairie School architect George Grant Elmslie is here. The main building of Aurora Public Library and a branch campus of Waubonsee Community College are also located downtown. Downtown Alive, a festival that includes live music and a variety of food booths, is held on three weekends (Friday and Saturday night) in the summer; Blues on the Fox (featuring national blues artists) is held on the Friday and Saturday of Father's Day weekend. Roughly 8,000–13,000 people attend. The quarterly AuroraArtWalk is hosted by the Cultural Creatives—a grassroots team of local artist, property owners, patrons, and the City of Aurora. The Riverfront Playhouse is a not-for-profit theater that has held a storefront location in downtown Aurora since 1978. Coulter Opera House 1874 1899 This was Aurora's first major playhouse/opera house/theater. It has been adapted as the Fifth Third Bank, formerly Merchants Bank. The upper floors have been converted to the Coulter Court Residences, an affordable-housing development. Paramount Theatre 1931 This has endured the longest. It was built on the site of the old Rialto Theater. The Paramount underwent a complete renovation in the 1970s and another in the 2000s. Wayne's World (1992) is a buddy film set in Aurora, with characters developed from a skit on the television show Saturday Night Live. One of the authors was from neighboring Naperville, Illinois and thought Aurora had the appropriate blue-collar feel desired. Most of the movie was filmed elsewhere, but some small sections were filmed on location in Aurora. One scene shows the local White Castle. The film's sequel, Wayne's World 2, is also set in Aurora. The Aurora Islanders/Blues/Foxes, a minor league baseball franchise, played from 1910 to 1915 in the Illinois-Wisconsin League. Their most famous player was Casey Stengel, who played one season with the team before being bought by the Brooklyn Dodgers. Stengel batted .352 and was the batting champion of the league for 1911; he also led the league with 50 stolen bases and had 27 outfield assists. The team played in a stadium on the west side in the former Riverview Park. He became known as a manager of baseball teams. Aurora has numerous youth soccer clubs, most of which have teams represented in the top five percent of the Northern Illinois Soccer League. Several youth soccer players from Aurora have received college scholarships to major college soccer programs throughout the U.S. In addition, Aurora maintains several developmental advantages for soccer enthusiasts. Three high-quality indoor soccer venues allow year-round soccer training and competition for children and adults. Additionally, several area traveling soccer clubs, as well as high schools, boast coaches and trainers who have played soccer professionally or have been starting players for national teams. Some played for teams that won the World Cup. Supplementing the local soccer training regimen are professional soccer trainers from England, Brazil, The Netherlands, Scotland, and other countries. Several played in the Premier League and for the Brazil national team, and for the Argentina national team. Fastpitch softball has been in Aurora since the 1930s. It gained popularity after World War II when the Aurora Sealmasters Men's team finished fifth in the nation in 1950. The Sealmasters won National Championships in 1959, 1961, 1965, and 1967, and World Championships in 1966 and 1968. The Sealmasters played their games at Stevens-Adamson Field, a significant fastpitch stadium on Ridgeway Avenue on the city's southwest side. The Sealmasters hosted many famous competitors from all over the United States, most notably Eddie Feigner and The King and His Court, as well as international opponents. There were many different and competitive men's leagues in Aurora from the 1960s through the mid-1990s. There are still a few leagues and teams playing to this day. In golf, the Stonebridge Country Club, on Aurora's far northeast side, was home to the LPGA Tour's Kellogg-Keebler Classic from 2002–2004. Stonebridge also hosted the Ameritech Senior Open from 1991–1995 on the Senior PGA Tour. Aurora University has Men's and Women's basketball, golf, tennis, track and field and cross country. It also has a men's football and baseball team, as well as women's softball and volleyball teams. Aurora University athletics are division III. Aurora has long been a regional transportation hub. The city is the final stop of the Burlington Northern Santa Fe line of the Metra commuter rail system, allowing rail service into Chicago. The city also has a stop at the Rt. 59 station on the BNSF Line. This station is on the border with Naperville and each city maintains a parking lot on their respective side of the tracks. The BNSF Railroad owns and maintains a rail yard in Aurora, which they named Eola Yard. Pace Suburban Bus operates local bus service within Aurora six days a week (no service on Sundays) and connects to cities such as Naperville, Geneva, Batavia, Oswego, and St. Charles. Metra trains and Pace buses stop at the Aurora Transportation Center. Greyhound buses used to stop there, but service was discontinued on September 7, 2011. Aurora does not have a stop for Amtrak trains, as the old station closed in the 1980s. Aurora City Lines, the old city bus lines, was closed in the late 1980s in favor of regional bus service. Aurora also had an extensive streetcar system, operated by the Aurora, Elgin and Fox River Electric Company, that served most neighborhoods. Aurora was served by a number of interurban lines, the most prominent of which was the Chicago Aurora and Elgin Railroad which provided service into Chicago. The STAR Line would have a third station at Ferry Rd. north of the BNSF Line. The Aurora Municipal Airport is a general aviation airport in Sugar Grove, Illinois, just outside Aurora. Although the airport is in Sugar Grove, it is owned and operated by the City of Aurora. The Aurora Airport is designed as a reliever airport for Chicago's O'Hare and Midway Airports and also handles a lot of international cargo. It is capable of landing Boeing 757 aircraft. In addition, the Federal Aviation Administration's (FAA) Chicago Air Route Traffic Control Center is on Aurora's west side. Aurora has two hospitals, one on the west side, Presence Mercy Medical Center, and one in Fox Valley, Rush–Copley Medical Center. Dreyer Medical Clinic and several other independent clinics and medical groups are spread throughout the city. The area surrounding Provena Mercy has evolved into a diverse healthcare district with services and offices. The city is home to Aurora University, two branches of Waubonsee Community College, and a branch of Rasmussen College. According to the census of Aurora's population over the age of twenty-five, 26% hold a bachelor's degree. Starting in the 1860s, Aurora was served by two main school systems, one on either side of the Fox River, which physically divides the city. In the mid-20th century, the district on the western side of the river expanded to include the students in the village of North Aurora, including the North Aurorans on the east side of the Fox. Additionally, in 1972, the Indian Prairie School District (IPSD) 204 was formed to serve the far eastern portion of Aurora within DuPage County. All three districts (Aurora Public Schools: West Side (District 129), Aurora Public Schools: East Side (District 131) and IPSD) have their headquarters and administrative offices within the Aurora city limits. As of 2005, there were at least forty public schools within Aurora city limits, serving residents of Aurora and neighboring communities. Due to the city's size, these are not the only three school systems serving residents – some students in the far north end of the city (north of I88 in Kane County) attend Batavia public schools, some on the far southwest side attend Kaneland CUSD 302 schools (headquartered in Maple Park), and some students in the far south end of the city (a small corner of the Kane, Kendall and Will County portions) attend Oswego public schools. Four of the schools in Oswego CUSD 308, Wheatlands Elementary, Homestead Elementary, Wolf's Crossing Elementary, and Bednarcik Junior High are within Aurora's limits. The Illinois Mathematics and Science Academy (IMSA) is a state-funded residential magnet school for grades 10 to 12. While IMSA operates under public funds (and uses the site originally designated West Aurora High School North Campus), it is managed independently of Aurora's other public schools. Any Illinois student who meets admission requirements may apply to attend IMSA, tuition free. Aurora is also home to other private schools. Within Aurora, there are three Roman Catholic High Schools, Aurora Central Catholic (Diocese of Rockford), Rosary, and Marmion Academy (Order of St. Benedict), and seven Catholic elementary schools operated by the Diocese of Rockford. Along with these three schools is Aurora Christian High School and Elementary School and Resurrection Lutheran School , a Pre-K-8 grade school of the Wisconsin Evangelical Lutheran Synod. Aurora is also home to Fox Valley Montessori School, one of the first Montessori schools established in Illinois in 1969, which offers a preschool and elementary program. The Aurora Public Library includes the main library, two branches, an express center, a support facility and a bookmobile. The library operations budget is $10 million and the staff numbers 85 full-time and 89 part-time employees. The library was funded in 1901 through a Carnegie grant. The Santori Public Library, the main library, was opened in June 2015, and offers a 3D printer and a digital media lab in addition to standard book and media services. The Beacon-News is Aurora's oldest business, first published in 1846, and is part of the Tribune Publishing. The newspaper has two editions: the Aurora edition and the Kendall County edition. The Beacon-News has been recognized repeatedly by the Associated Press, Illinois Press Association, Northern Illinois Newspaper Association and the Chicago Headline Club as one of the best daily newspapers in Illinois. In 2008, reported major crimes in Aurora were at their lowest level in nearly three decades. The Chief of Police attributed the drop to a number of factors but especially credited the hard work of the city's police officers and the increase in anti-gang priorities. Gang violence had reached a high in the 1990s, with the city averaging nearly 30 murders per year. In 2008, Aurora only had 2 murders. In July 2007, the Aurora Police Department and the FBI conducted "Operation First Degree Burn," a sweep that resulted in the successful arrest of 31 alleged Latin Kings gang members suspected of 22 murders dating back to the mid-1990s. Aurora has also adopted programs such as CeaseFire to reduce gang violence and prevent youths from joining gangs. Aurora had 7 murders in 2016. Environmentally, Aurora has long dealt with pollution of the Fox River. The river was heavily polluted up until the 1970s by factories that had lined the river for over a century. Cleanup efforts have been successful with the help of state grants and volunteer efforts. On September 26, 2014, a fire at an air traffic control edifice in Aurora (also known as the "Chicago Center") caused nearly 2000 airline flights to be grounded. Brian Howard, an employee of Harris Corporation, was charged in the incident. At approximately 1:30 PM on February 15, 2019, police responded to an active shooter situation in east Aurora to find that 45-year-old Gary Martin had opened fire on fellow employees at the Henry Pratt Company. Five officers and several civilians were injured in the ensuing standoff, after which police entered entered the building and neutralized Martin. In total, the incident left six dead (including the gunman) and numerous others wounded. It was the first major shooting in the town's history. Stolp Island with Leland Tower from New York St. Bridge. Detail of Memorial Bridge figure Memory. Former main Aurora Public Library, remodeled c. 1969. The Old Aurora Post Office, now home to the SciTech Museum. The carousel and food court at Fox Valley Mall, opened 1975. Statue outside the Aurora Transportation Center, Aurora (Metra). ^ "Our Campaigns - Candidate - Richard C. Irvin". www.ourcampaigns.com. Retrieved 23 March 2019. ^ "Aurora (city), Illinois". State & County QuickFacts. U.S. Census Bureau. 8 July 2014. Archived from the original on 25 July 2012. Retrieved 16 September 2014. ^ a b c "City and Town Population Totals, Incorporated Places 2010–2017 (PEPANNRES): Illinois". U.S. Census Bureau. Retrieved February 6, 2019. ^ "Annual Estimates of the Resident Population for Incorporated Places of 50,000 or More, Ranked by July 1, 2013 Population: April 1, 2010 to July 1, 2013". U.S. Census Bureau, Population Division. May 2014. Retrieved 15 September 2014. ^ "The fastest growing US cities: Cities ranked 1 to 100". The City Mayors Foundation. Archived from the original on 26 September 2011. Retrieved 25 September 2011. ^ "Table 1. Annual Estimates of the Population of Metropolitan and Micropolitan Statistical Areas: April 1, 2010 to July 1, 2012 (CBSA-EST2012-01)". U.S. Census Bureau. June 2013. Archived from the original (CSV) on 1 April 2013. Retrieved 5 June 2013. ^ Following Cleveland, Ohio, and Wabash, Indiana. "About Our City". City of Aurora, IL. 2011. Archived from the original on 29 July 2012. Retrieved 25 September 2011. ^ a b "Aurora, IL". www.encyclopedia.chicagohistory.org. Archived from the original on 10 December 2008. Retrieved 2 May 2018. ^ a b Torp, K. "History of Aurora, Illinois". genealogytrails.com. Archived from the original on 9 July 2012. Retrieved 2 May 2018. ^ "Aurora Township, Kane County, Illinois". Historical Encyclopedia of Illinois. Kane County Illinois Genealogy Trails. Archived from the original on 9 July 2012. Retrieved 24 September 2011. ^ "G001 – Geographic Identifiers – 2010 Census Summary File 1". United States Census Bureau. Retrieved 2015-12-25. ^ "NCDC: U.S. Climate Normals". National Oceanic and Atmospheric Administration. Archived from the original on 2014-07-14. ^ Lahmeyer, Jan (2003). "Historical demographical data of the urban centers: Illinois". Populstat.info. Archived from the original on 8 September 2008. Retrieved 24 February 2010. ^ "Population of Kane County (1850–1900)". Kane County, Illinois Genealogy Trails. 2010. Archived from the original on 13 July 2012. Retrieved 24 February 2010. ^ "City of Aurora CAFR" (PDF). aurora-il.org. Archived from the original (PDF) on 12 July 2014. Retrieved 2 May 2018. ^ "Wayne's World (1992)". Archived from the original on 25 May 2016. Retrieved 2 May 2018 – via www.imdb.com. ^ "Greyhound drops Dixon from service". saukvalley.com. Archived from the original on 1 February 2014. Retrieved 2 May 2018. ^ "Resurrection Lutheran Church & School". ^ "Santori Public Library". santorilibrary.com. Archived from the original on 5 March 2016. Retrieved 2 May 2018. ^ "About The Beacon-News". Sun-Times Media Group. 2010. Archived from the original on 2010-05-27. Retrieved 2010-01-30. ^ a b c Working, Russell (2008-12-30). "Aurora murders at lowest level since 1987". Chicago Tribune. Archived from the original on 21 April 2012. Retrieved 30 January 2010. ^ a b c "Aurora On Track For Another Crime Decline". Official website. City of Aurora, IL. 2009-12-30. Archived from the original on 20 July 2011. Retrieved 30 January 2010. ^ Kimberly, James (2007-06-29). "31 indicted in 22 Aurora-area gang killings". Chicago Tribune. AccessMyLibrary. Retrieved 30 January 2010. 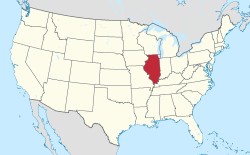 ^ "Crime in Aurora, Illinois (IL): murders, rapes, robberies, assaults, burglaries, thefts, auto thefts, arson, law enforcement employees, police officers, crime map". www.city-data.com. Retrieved 2018-10-04. ^ "Illinois EPA Director presents $300,000 grant to Mayor of Aurora for watershed protection efforts". Illinois Government News Network. State of Illinois. 23 April 2007. Archived from the original on 2 April 2012. Retrieved 25 September 2011. ^ "Man faces charges in FAA facility fire - CNN.com". CNN. 26 September 2014. Archived from the original on 27 September 2014. Retrieved 27 September 2014. ^ "FBI: Contract worker set fire at FAA center, tried to kill himself". chicagotribune.com. 26 September 2014. Archived from the original on 26 September 2014. Retrieved 27 September 2014. ^ "Chicago air traffic halted over fire at FAA facility". 26 September 2014. Archived from the original on 26 September 2014. Retrieved 27 September 2014. ^ Aamer Madhani; Ben Mutzabaugh; William Spain & USA TODAY (26 September 2014). "Chicago flights grounded after fire at FAA radar facility". Archived from the original on 26 September 2014. Retrieved 27 September 2014. ^ "Fire at air-traffic center disrupts 1,800 flights". Yahoo News. 27 September 2014. Archived from the original on 26 September 2014. Retrieved 27 September 2014. ^ "Contract Employee Charged in Fire That Grounded Chicago Flights". ABC News. Retrieved 27 September 2014. ^ 21, Diario. "Diario 21 - El Periodico Plural del Estado - Principal". www.diario21.com.mx. Archived from the original on 29 January 2018. Retrieved 2 May 2018. ^ a b 21, Diario. "Diario 21 - El Periodico Plural del Estado - Principal". www.diario21.com. Archived from the original on 28 January 2018. Retrieved 2 May 2018. ^ 21, Diario. "Diario 21 - El Periodico Plural del Estado - Principal". www.diario21.com. Archived from the original on 9 January 2018. Retrieved 2 May 2018. Wikimedia Commons has media related to Aurora, Illinois. Wikivoyage has a travel guide for Aurora, Illinois. Wikisource has the text of a 1911 Encyclopædia Britannica article about Aurora, Illinois. Aurora Fire Department history honoring its 150th anniversary, in 2006. "Aurora, a city of Kane county, Ill." . The American Cyclopædia. 1879.